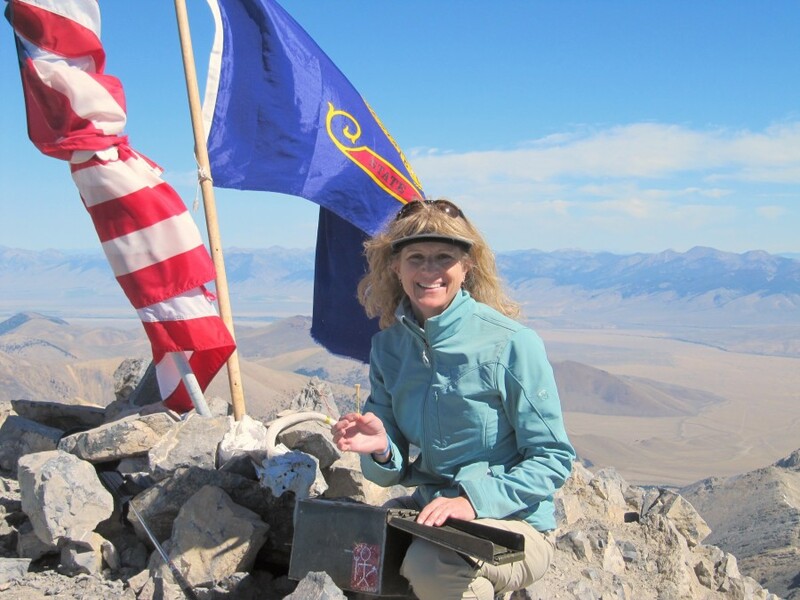 The Southwest or “Chicken Out” Ridge, as it is more commonly known, on 12,662-foot Mount Borah is always a great climb and #10 on my Favorite Climb list. 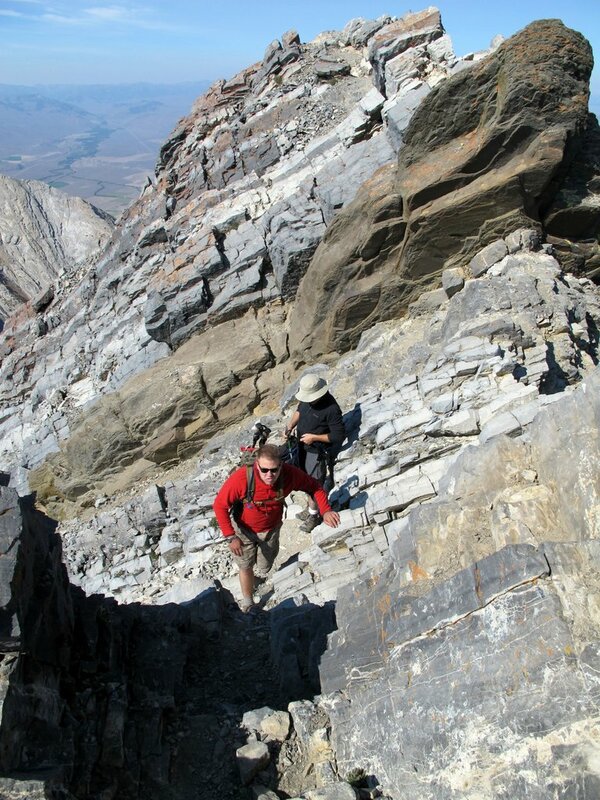 As the most popular peak of the 12ers, Mount Borah’s standard route has become crowded most summer weekends. 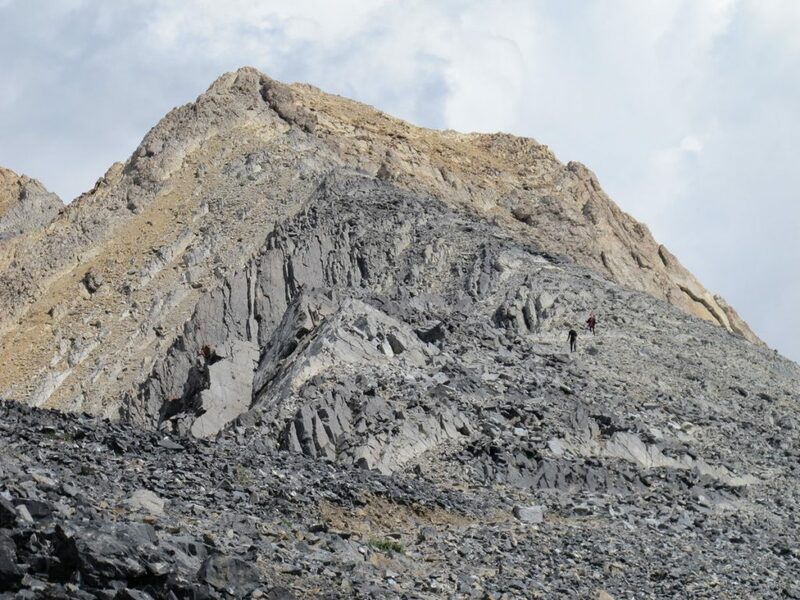 It is not unusual to see a full parking lot and 50 or more people attempting to climb the mountain by its most popular route. 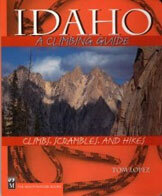 NOTE: Access information for Mount Borah’s Standard route is found on pages 271 and 292 [(B)(6)] in the Climbing Guide. 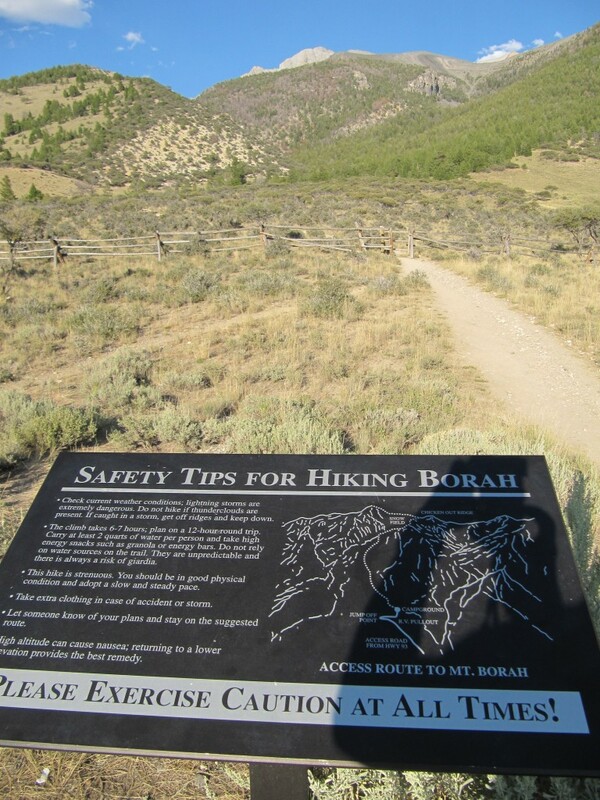 The trailhead is located north of Mackay, Idaho along US-93. Look for the signed turn between mile markers 129 and 130. 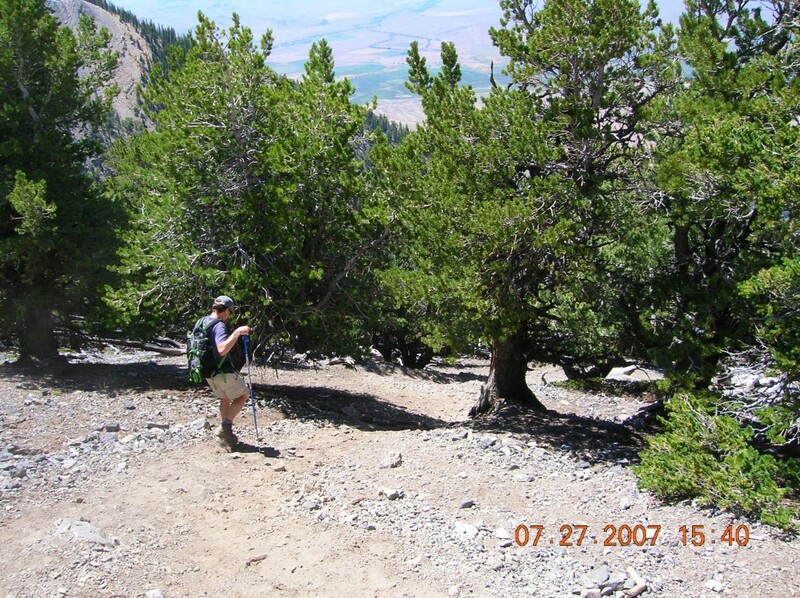 Over the last 10 years, a well constructed trail has been built to replace the original climbers trail. 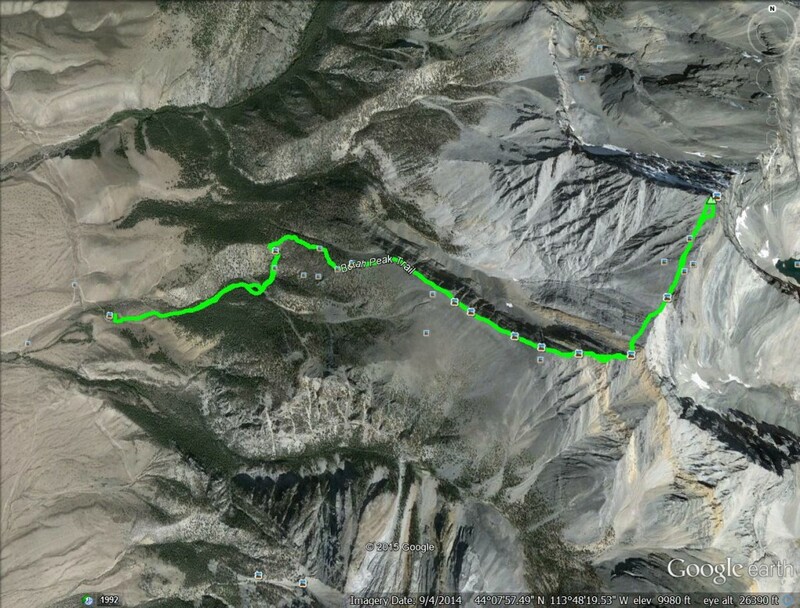 This trail leads from the parking lot past the saddle just east of Point 8714 and then on to treeline (see map below). Needless to say, the trail makes the first part of the climb much easier. From treeline, the Standard route continues up toward Chicken Out Ridge without any new improvements but it is well worn in. 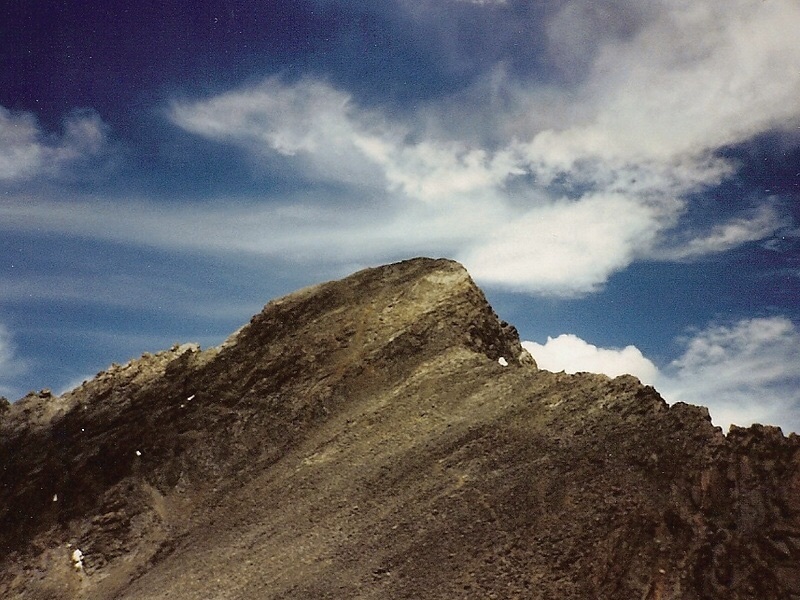 This is the easiest route to the summit. 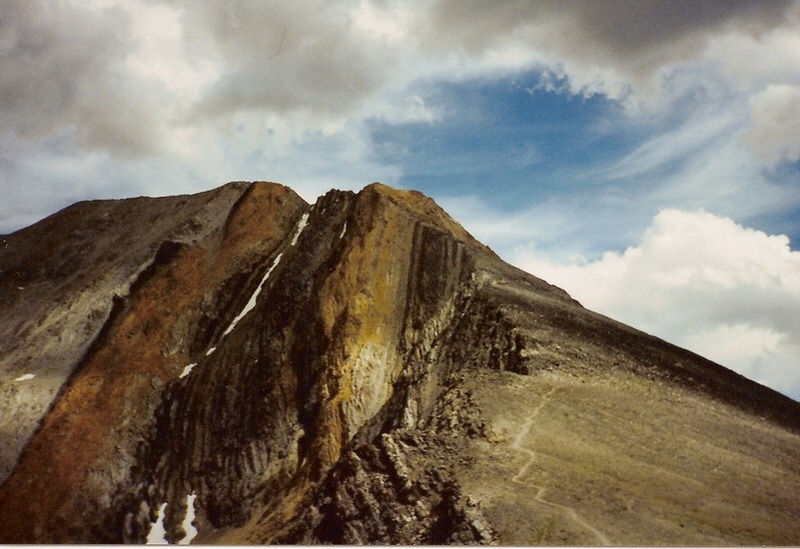 Although many inexperienced people climb this route each year, do not underestimate its potential difficulties. 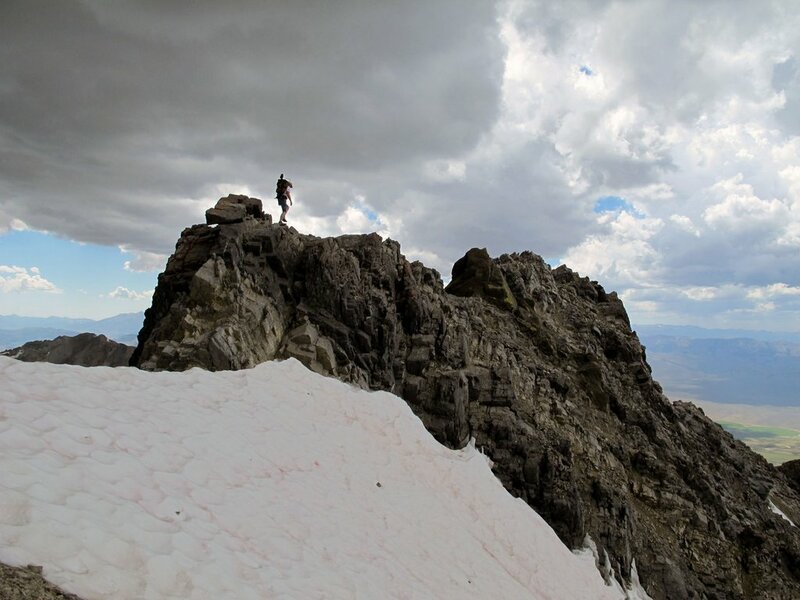 The route climbs more than 5,400 feet in less than 4.5 miles and there are many spots from which you can fall significant distances. It is arduous and mentally challenging, even under the best of conditions. 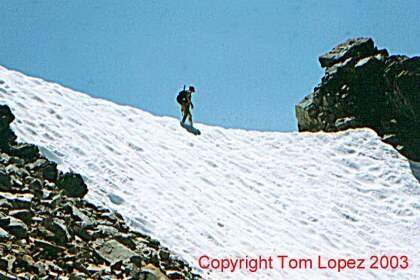 When the route is covered with snow, it is best left to experienced mountaineers. 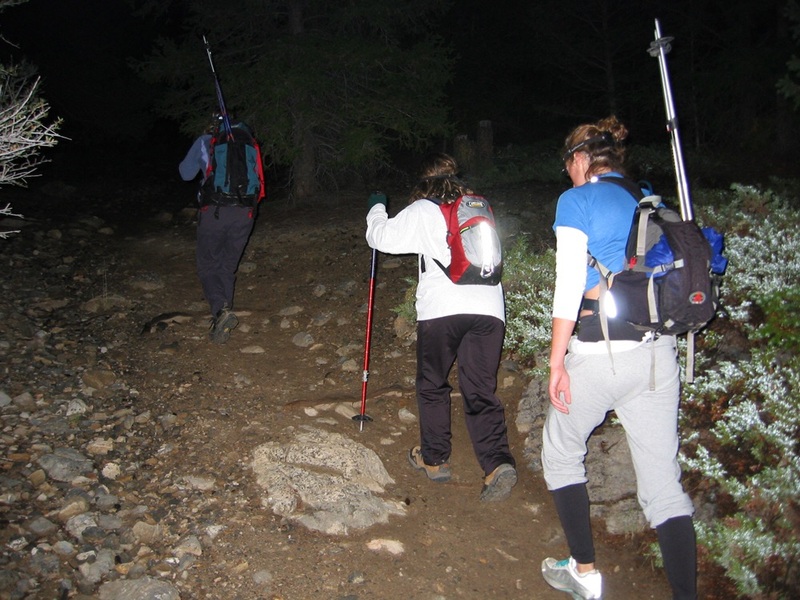 Many people start the climb before the sun rises, which is a good idea especially when thunderstorms may develop later in the day. Additionally and most importantly, there is NO shortcut bypassing Chicken Out Ridge. Do not believe rumors about a shortcut. Use this link for the Standard Route Warning for additional details. Mount Borah’s Southwest “Chicken Out” Ridge route. From the end of Mount Borah Road [(B)(6)] at roughly 7,200 feet, follow the well-worn trail through the sagebrush-covered slopes and into timber. After 0.5 miles, there is a new section of trail that climbs around the head of a gully and tops out on a small saddle at 8,600 feet, which is east of Point 8714, as shown on the map. 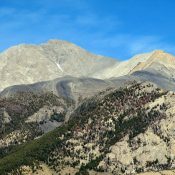 The trail now becomes a climbers route that runs due east toward Point 10632, zigzagging and climbing steeply to treeline. As you leave the timber, the ridge becomes more defined and easier to follow. 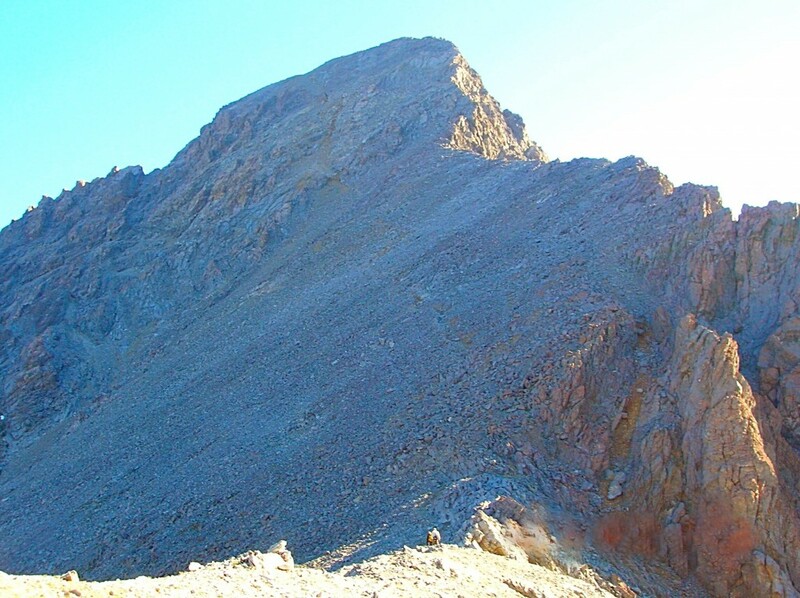 The route continues up the southwest-trending ridge toward the main crest at Point 11898. 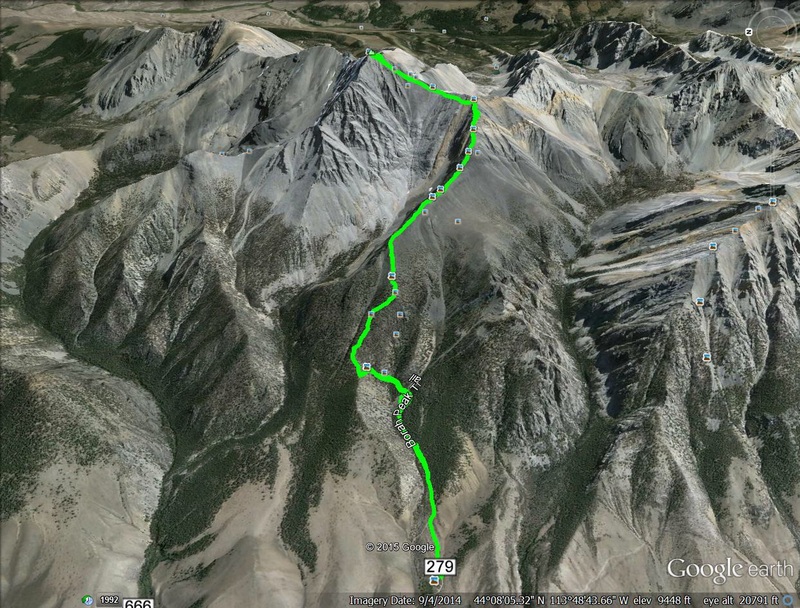 The final 300 feet of elevation gain to the main crest is known as Chicken Out Ridge. The view looking up toward Chicken Out Ridge. The view looking down from Chicken Out Ridge. 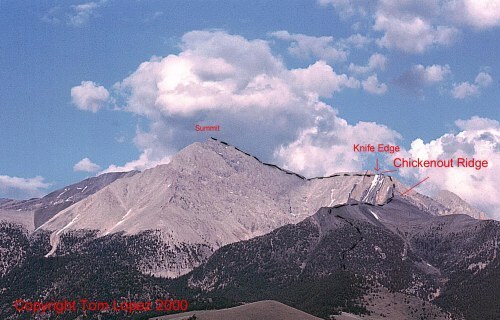 Chicken Out Ridge climaxes in a narrow, knife-edged col just before the main crest. 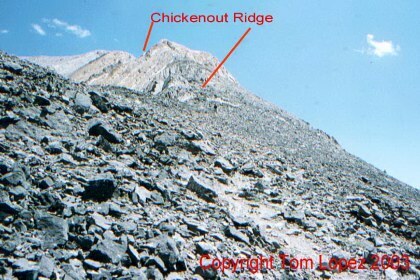 Although the route is well marked, many people are reluctant to cross the lower, rocky-ribbed section of Chicken Out; hence the name. This section can be treacherous if it is covered by snow or ice. The snow bridge is the next most talked about obstacle. 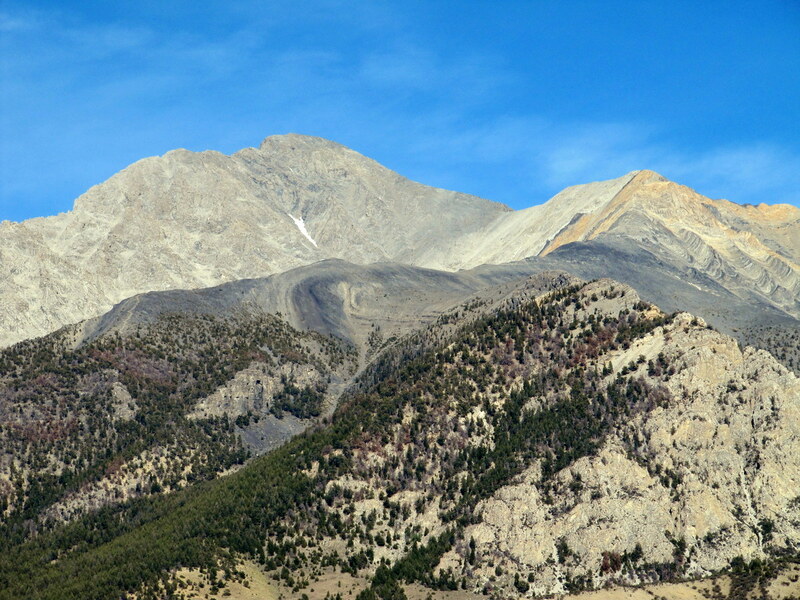 It is an exposed ridge that is often covered in snow. 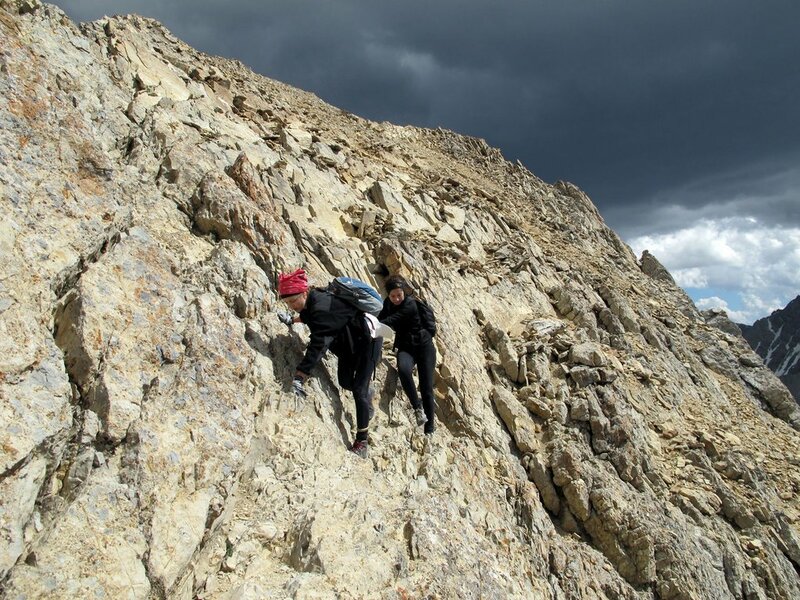 It is crossed by first down-climbing a 20-foot pitch, often referred to as the “nose,” and then carefully kicking steps in the snow. 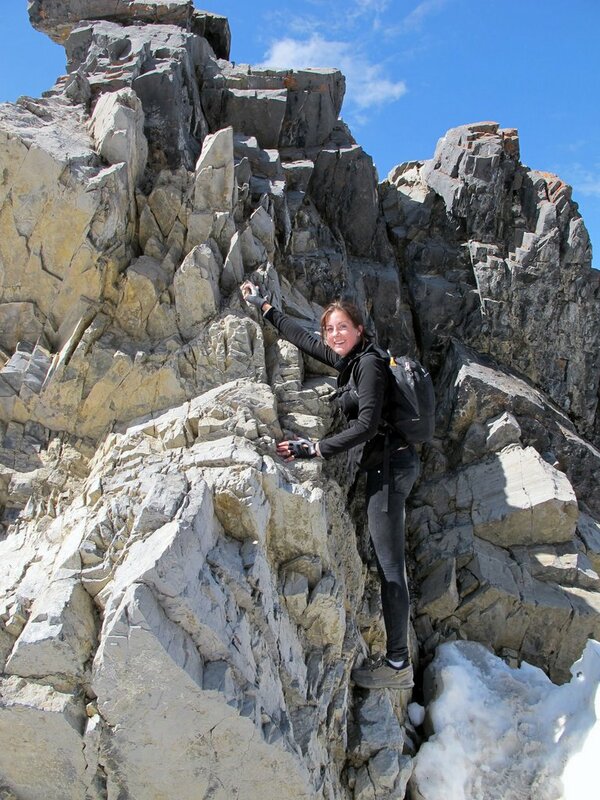 The step from Chicken Out Ridge to the knife edge/snow bridge is the crux of the climb. Climbing the nose on Chicken Out Ridge. 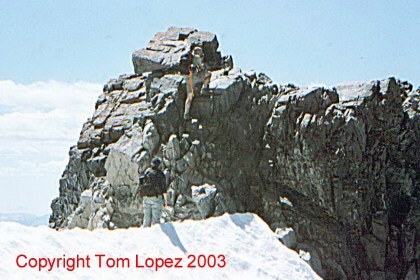 While an ice axe is recommended to cross the snow bridge, there is often a wide trail across the snow kicked in by other climbers. In late summer, the bridge may be free of snow. 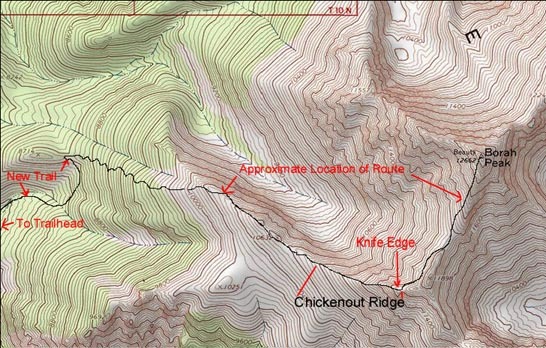 Once across Chicken Out, a good trail follows the ridge on the west side of Point 11898 to the saddle on its north side (see map). 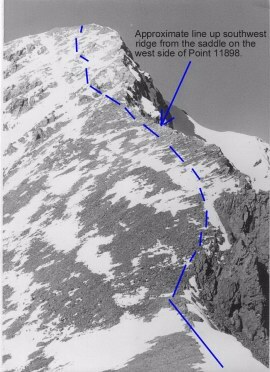 The route from the snow bridge to the summit. 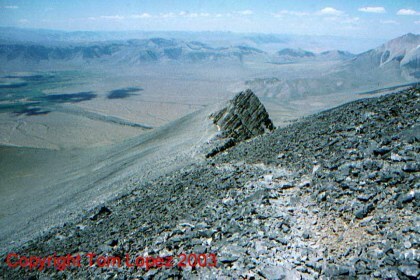 From the saddle, the ridge can either be climbed directly or by following a fair trail on the ridge’s west side through broken rock bands and talus to the summit. 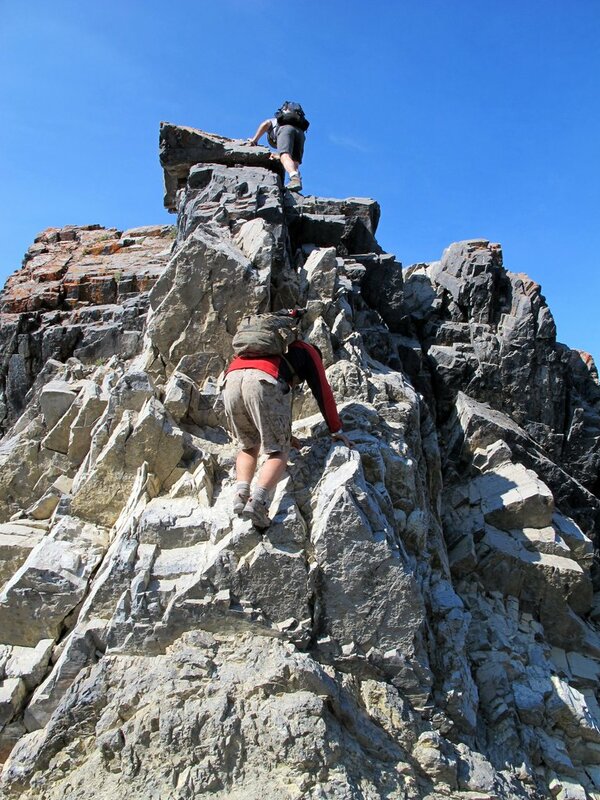 The trail crosses over lots of loose rock, which can be exhausting. Take plenty of water and expect the ascent to take between 3 and 12 hours, depending on the abilities of your party. Erik Leidecker — A professional guide’s perspective. 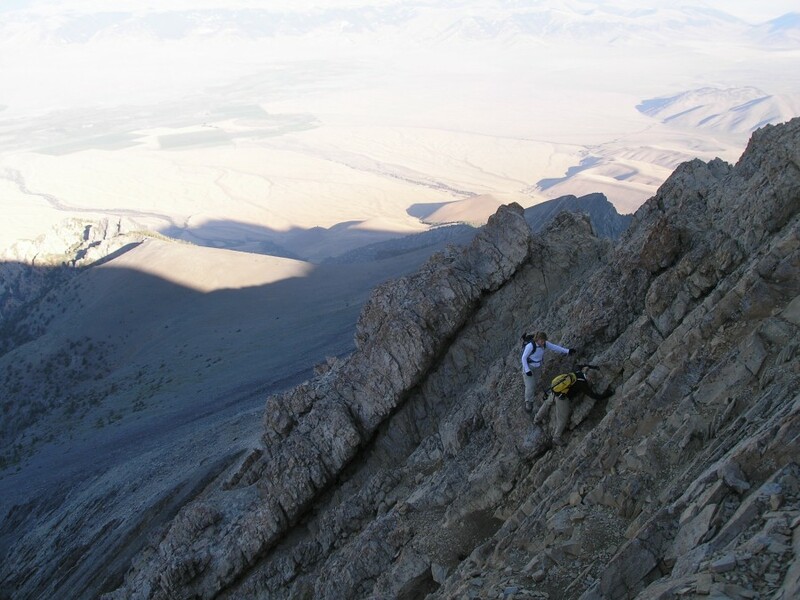 The following photos will give you a good idea of the terrain you must cross on Chicken Out Ridge, which is the crux of the climb.